Please call 01608 663759 if you require assistance. To find out the length of ramp required to create a 1:8 gradient please enter height of step below. 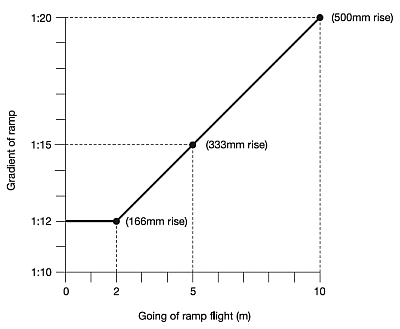 1:6 (10°)** - Acceptable in some cases for short threshold ramps. 1:8 (8°)** - A useful balance between gradient and space, suitable for portable ramps in some assisted applications and events, etc. 1:12 (5°) - Often required by social services/local authorities. Minimum required by Part M of building regs for installed ramps. 1:15 (4°) - Sometimes required by social services/local authorities for independent access. Recommended gradient for wheelchair ramps. A 500mm high step should have maximun gradient of 1:20, a 333mm high step should have maximun gradient of 1:15 and a 166mm high step should have maximun gradient of 1:12. For goings between 2m and 10m it is acceptable to use a sliding scale. i.e. 1:13 for 3m, 1:14 for 4m, 1:16 for 6m, etc. Our wheelchair ramp slope calculator is devised for portable wheelchair ramps and is based on a 1:8 gradient, ensure this suits your requirements before selecting your ramp and that the ramp you choose does not create a slope that is too steep for independent wheelchair users.